5 Bobblehead Figures with suction cup at the bottom which allows the figures to stand. 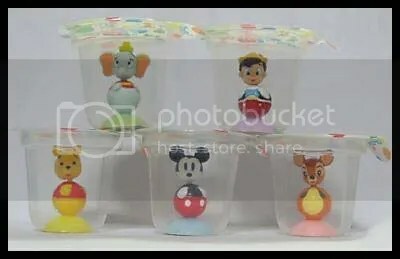 Mickey Mouse, Winnie the Pooh, Dumbo, Bambi & Pinocchio each in a cute Jelly Cup packaging. Size = Approx. 2-3cm (height of figures). Return to Mickey & Friends Items, Winnie & Friends Items or Other Disney Items.